Our last cherub, unless the Lord should add to our number, is P. His story is also filled with wonder and tender mercies as we look back and see the hand of God bringing us together. I have started a journal for each of my children from the beginning of heart pangs and in January of 2004 I started one for P. In the very first entry, I mentioned that people have often told me over the years how great it would be if I just got pregnant...though that would indeed offer obvious reasons for rejoicing (children are gifts, whichever way God gives them), I found myself fighting the sentiment for a couple reasons. The biggest reason is that God has grown in me a passion to help fatherless ones get grafted into Christian families, and I love the privilege it is to be one of those families. The lens of earthly adoption has helped me see the glorious gospel of God adopting us into His family so much more clearly. I am moved daily to adore the Father of the fatherless, knowing I am no longer fatherless because of Him. He is so worthy of imitation! Secondly, the sentiment seems to implicate, whether intentionally or not, the idea that homegrown kids are preferable over grafted ones, and that adoption is a plan B sort of deal. I believed those implications when adopting M, initially...I have since repented. God tells us children are a heritage from Him, and truth be known, that includes grafted children EVERY bit as much as homegrown ones. P was content and cheerful for the most part, from the get go...no "grieving screaming" with this round of adoption, but what we did experience was a boy who would respond to just about everybody the same...it was many, many months before he bonded to us as a family in particular. The night before his homecoming, we received a call letting us know there was a question about whether he would be on the plane or not...he was sick and he hadn't passed the initial flight physical. My anxiety-resistance muscles got a serious workout that night as I exercised trust in the Lord (who works all things together for good to those called according to His purpose). He did make it on the plane, and we had fun trying to decipher the medicine packets that came with him (written in Korean). We are good friends now with our Pediatrician, who we've seen often with P (and with R, especially early on)...he's had breathing issues, many trips to the ER/hospital for various things, and couldn't hear for about a month when he first came home, but I think it was nursing him through it all that bound us together so tightly. He is so our boy! And God has restored him to good health which we give Him all thanks for. 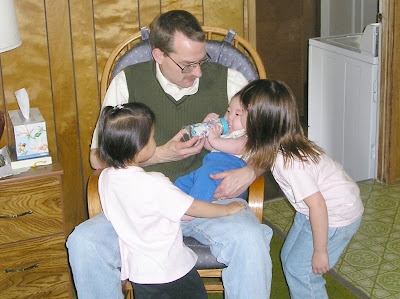 In May of 2006, his adoption was finalized (we had 55 people at our house helping us celebrate! )...woo hoo! Oh, he IS such a fun boy! I love his enthusiasm and joy of life! Yay for boys! Oh - love the pictures and his story. He is such a handsome boy!!!! 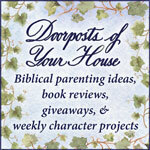 Oh- what miracles....thank your for sharing snipits with us to enjoy God's wonderful stories!!! Beautiful! I love being able to read your story! !